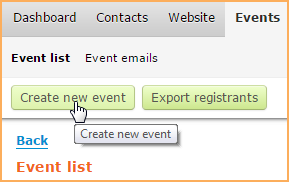 From your events list, click the Create new event button. Choose which type of event you want to create. Choose Simple if you are holding a free event that requires only an RSVP from your registrants, you can set up a simple event that requires less setup on your part, and provides for one-click registration by your registrants. When you create a simple event, you don't have to bother setting up registration types or a registration form. You just need to provide event details and set up your event emails. A single non-modifiable registration type of RSVP will be automatically created for you. Simple events do not allow for guests, registration limits, and cannot include multiple sessions. For more information, see Setting up a simple event (RSVP only). Choose Advanced if your event charges a registration fee, has a registration limit, allows for guests, requires additional registration information from your registrants, or spans multiple sessions, you need to set up an advanced event. For more information, see Setting up advanced events. On the screen that appears, you can specify the event name, location, date, and cost of the event. The event title and start date are required fields. After you enter the required information, you click the Save button to save the event. For advanced events, click the Registration form link to customize the event registration form. For more information, see Event registration form. For advanced events, click the Registration types & settings link to set up your event registration types (or ticket types). You must create at least one registration type before you can enable registration for an advnced event. From the Registration types & settings tab, you can also set a registration limit for the event, and control whether multiple registrations are allowed. Click the Emails link to set up email announcements, reminders, and confirmations for your event. For more information, see Event emails. Click the Event details link to return to the event details screen. From here, you can enable registration, limit the number of registrants, and control who can access the event, either directly from the event calendar or via a link. Initially, access for new events is set to admin only. For more information, see Restricting event access.